Photocopying is the process of photographically reproducing a document of text, illustrations, or other graphic matter. The most common photocopying method used today is called xerography (from the Greek words for "dry" and "writing"). 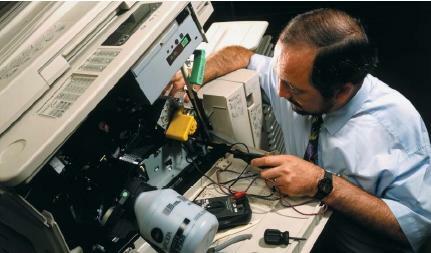 The mechanics of photocopying is based on the principle of photoconductivity (when certain substances allow an electric current to flow through them when light is applied). For example, when light is absorbed by some of the electrons (particles that have a negative charge) that make up selenium (a nonmetallic chemical element that is used in the photocopying process), the electrons are able to pass from one atom to another when voltage is applied. When the light source is taken away, the electrons lose their mobility or ability to move. Electrostatics: Relating to painting with a spray that utilizes electrically charged particles to ensure a complete coating. Toner: A material that carries an electrical charge opposite to that of a photoconducting surface that is added to that surface in a copy machine. Xerography: A method of copying that uses dry powder, electric charge, and light to fuse an image onto paper. document onto the drum. This causes the positive charge on the selenium-coated drum to fade except from the area to be copied. This area remains charged. to the copied image on the paper and it adheres the toner permanently to the paper. Over the years, many improvements in the photocopying machine have taken place. Some enhancements include sorting and collating (arranging in order), enlarging or reducing the copied material, printing on both sides of the paper, and reproducing in color. 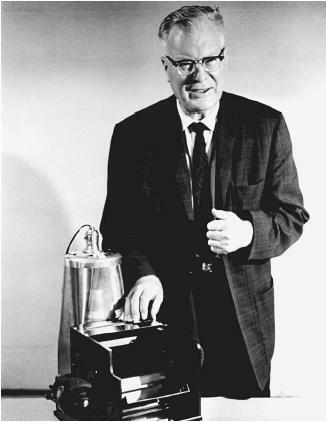 Xerography was invented by American physicist Chester F. Carlson (1906–1968) in 1938. After earning his physics degree from the California Institute of Technology in 1930, Carlson accepted a job working for the P.R. Mallory Company, an electronics business in New York. Working in the patent department, Carlson was frustrated by the difficulty of obtaining copies of patent drawings and specifications. He decided to use his time away from work to find a solution to the problem. Focusing on the concept of electrostatics, Carlson spent four years before succeeding in production his first "dry-copy." The first successful copy was a notation of the date and location that read "10.−22.−38 Astoria." (Carlson lived in Astoria, Queens, New York at the time.) In 1940, Carlson obtained the first of many patents for his xerographic process. Wanting to find a company that would help him develop and market his idea, Carlson began showing his solution to many organizations. After more than twenty firms turned down his invention, Carlson finally reached an agreement in 1944 with the Battelle Memorial Institute, a nonprofit research organization. Three years later, the Haloid Company (later the Xerox Corporation) became a partner in the development of the xerography technology. Finally, after years of development, the first office copier—the Xerox 914—was introduced in 1959. Which chemicals use in imaging drum ? ?And manufacturing process ? ?